Should the Race of African Leader Alain St. Ange Matter? 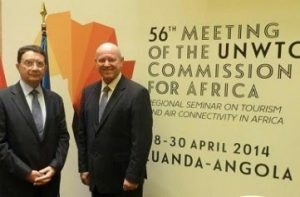 Victoria (Seychelles) – April 17, 2017 (travelindex.com) – A prominent African leader who has pledged his heart to Seychelles, the Indian Islands and Africa, former Seychelles Minister of Tourism Alain St. Ange threw his hat in the race for the next UNWTO Secretary General in January 2017. Since becoming Seychelles Director of Tourism in 2009, then CEO in 2012, and a few years later the island nation’s Minister of Tourism, he has had culture inclusion and innovative tourism at the forefront of his agenda. As a tourism leader who has in many ways fought hard for the interest of Africa, St. Ange happens to be white. Despite the fact that he is a non-black African, St. Ange has done much towards trying to preserve African culture and history. As Seychelles Tourism Minister, he greatly enhanced Fet Afrik, a festival that celebrates the ancestral bond with Africa annually on Africa Day on the islands. He also produced many cultural events for African creative artists and musicians to have a stage to present their work. While in office, he also worked to further develop the Seychelles Mission Lodge of Sans Soucis Slave Ruins. He explained: “This site needed to be saved for future generations, because it was a facility with history for young African slaves, coming from all over Africa, who landed in Seychelles by British ships at the time that slavery was being abolished.” Under St. Ange’s leadership, tourism visitation to the Mission Lodge of Sans Soucis Slave Ruins increased dramatically. A firm believer in preserving heritage sites, he proposed to the African Union to establish a tourism body for an African Union Heritage Site label. “The time has come for Africans to work together to give recognition to sites we see are dear to us, to our people, and to our country,” said St. Ange. With tourism collaboration as one of his major platforms for comprehensive strategic marketing for the entire continent of Africa, his initial appeal for an African brand was supported by leaders at the African Union Ministerial working group meeting for the Africa AU Agenda 2063 held in Seychelles a few years ago. Committed to enhancing Africa’s potential in tourism development through the African Union, St. Ange believes that the challenges felt and the rivalries on the continent can be seen with a fresh look when African States unite under an Africa Tourism Brand. “We can still market our own countries, but the comprehensive Africa Tourism Brand will help increase our visibility and make us more relevant in the world of tourism,” he said. Another measure that St. Ange took when Minister of Tourism was initiating the removal of the 1935 Colonial Era Drums Regulation of the Penal Code from the laws of Seychelles which was established to prohibit the beating of drums or tambours or the blowing of shells, etc. at night after 9 pm in Seychelles. This measure was a symbolic move for inclusion of all people as it renounces the penal initiated by the British Colonial Government when Seychelles was under colonialism. St. Ange said that he wanted to appeal these laws in an effort to unite the people and bring together every Seychellois immaterial of colour of skin, political affiliation and religious beliefs. As evident by his founding and directing the International Carnival in Seychelles, the world’s first multi-cultural carnival that was an enormous success, St. Ange believes that tourism can be a tool for global cultures coming together. With many countries already having their own unique carnivals, St. Ange envisioned an international carnival that would bring nations together in one setting to not only showcase their cultures, but also to help promote an understanding of different cultures in an effort to help bring about world peace. Believing that culture drives tourism, he has traveled the globe with a message of unity and economic development through culture tourism. He has been a sought after speaker in Africa and around the globe regarding tourism promotion and development. St. Ange defied the odds and bought Seychelles tourism arrivals up doing a time of economic downturn. Because of his outstanding work and proven leadership skills in tourism, his tourism methods have been applauded around the globe. He is a founding leader of the International Council of Tourism Partners, (ICTP), a grassroots tourism coalition of global destinations committed to quality service and green growth. With a stellar career in tourism, it seems like it would be a given that St. Ange would or should seek the highest tourism office in the world. But why did he wait until January to announce his candidacy? Because it was a late announcement, he was labeled a ‘spoiler’ by some African leaders because they felt he was hurting the African Union- endorsed candidate Zimbabwe’s Dr. Walter Mzembi’s chances of becoming the first black UNWTO Secretary General. “We don’t need two African candidates,” some of them said. To the astonishment of many, Alain St Ange, the tourism leader who had once partnered and made friends with many members of the African Union and other tourism professionals around the globe, was now flashed in the media as a ‘spoiler’. It was during the 2016 International Seychelles Carnival, that journalist from around the world waited impatiently for St. Ange to announce his candidacy. He never did, so the global media inquired of him about the UNWTO Secretary General’s office. His response was that he would not make an announcement just yet out of respect for the present Secretary General Talib Rifai having another year in office. Nonetheless, journalists and travel officials continued to inquire, and some even compelled St. Ange to become a candidate. When he finally announced his candidacy in January, it created a backlash with some African leaders saying that his candidacy would only split up the votes. Some of these leaders reportedly journeyed to Seychelles to ask St. Ange to pull out of the race. So many Africans begin to wonder if he should indeed step aside to increase the chances that a black African should get the office. Then came the accusations that St. Ange was running at the urging of a European conspiracy to block an African from winning. St. Ange supporters found this theory hard to believe, and were appalled by such accusations about a man whom they believed only motives for the office was his passion for tourism, and a chance to implement some of his proven strategies to make a difference in tourism. Due much in part to these two well-qualified African candidates running neck to neck, and both being desirous of the office, the 2017 election of the next UNWTO -Secretary General has been one of the most heated and, maybe even controversial elections to date. All of this begs several questions: How much does race play a factor for the supporters and non-supporters of the two African leaders? Should Alain St. Ange, who has done so much to bring people together through cultural and tourism, and who has worked so hard to promote the continent of Africa have to apologize for being a white? Would African leaders support St. Ange if he were a black African? Would it indeed be an historic gesture, representing a more united world and movement toward a colorblind global community if a black leader is elected for the first time as UNWTO-Secretary General? After witnessing and learning firsthand St. Ange’s dedication to tourism when visiting Seychelles carnivals, this writer mentioned to him that he should take some of his tourism know-how to the United Nations as Secretary General. So, of course I was in support of St. Ange when I learned he might be a candidate. Then I learned that Zimbabwe’s Dr. Mzembi was running, another candidate that I thought would be perfect for the job. I later wholeheartedly supported Dr. Mzembi, on behalf of the African Diaspora media because a reputable journalist and confidant of St. Ange told me that St. Ange would not be running. Then St. Ange made his announcement at the beginning of the year that he was indeed a candidate. Because I have supported both, it would be hard for me at this late date to endorse again, even though I am keenly aware of St. Ange’s passion and expertise in tourism firsthand. What I do know is that both African tourism leaders have excellent records in their fields, and either as the next UNWTO Secretary General would be a global victory. If one of these great African leaders is nominated, I further hope that the one who is not selected will support wholeheartedly the newly-elected secretary general tourism efforts. But whether the victor for this office is from Africa, Armenia, Brazil, Colombia, Georgia or Korea Brazil, I am hoping that he will represent all people and use the office of UNWTO Secretary General to help to bring about equality, world peace and economic development through tourism.